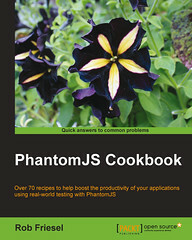 Come February, I started tinkering with a new approach to the formulation. 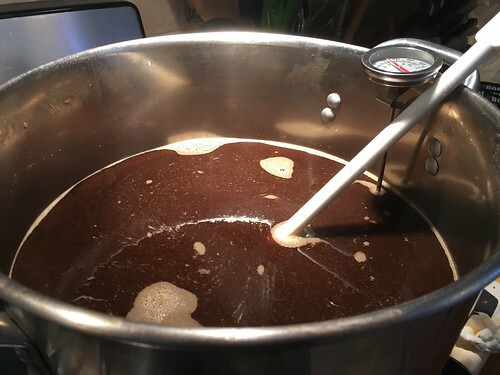 I wanted to boost the rye (38% up from 29%2), I wanted to minimize the chocolate malt and try adding for steeping after the main mash, I wanted to avoid using any dark malt extract3, and otherwise try to tinker only as needed to get the balance right. I tinkered with the specifics for a couple of weeks, getting the balance of my grains right, making slight adjustments to the hop schedule to get the bittering I wanted, etc. The real kicker (and one I’m running into more and more these days) was trying to figure out a suitable water/grist ratio. The volumes suggested by BeerSmith don’t technically overflow my kettle… until I add the grains. But I also believe (based on my experience with Honestatis (Mk. VI)) that I haven’t quite figured out these ideal ratios, and that my conversion suffers when the ratio is too low. Nevertheless, I made some calculations around what I could pull off in my kettle and kept those notes handy. By early April, I was ready to brew this bad boy. A couple days before brew day, I got a big starter going so I could over-build and harvest some of it before pitching. We’ll come back to this yeast for later discussion. The brewing got started bright and early, getting the strike water up to 162°F so I could mash in at 151.3°F. I did my usual towel wrap to hold in the heat, but otherwise let it free-fall, finishing the saccharification rest at 148.7°F. Let me just say… that kettle was mighty full. After the main mash, I added one pound of chocolate malt for color, letting it steep 15 minutes while I heated the kettle for mash out. When that was done, I did my usual “big squeeze” of the grain bag. The grist was really holding onto a lot of water (even with the squeezing) and I “faux sparged” with another two quarts of water to get my volume up to about 3.1 gallons with a gravity of about 1.058. From there, I went about my business with boiling, adding my extracts, and following my hop schedule. (Also, for some reason this one foamed like crazy when I did my hop additions.) After boiling, chilling, and the hop stand, I had 2.7 gallons of wort at 1.126. I topped off in my carboy and poured over. 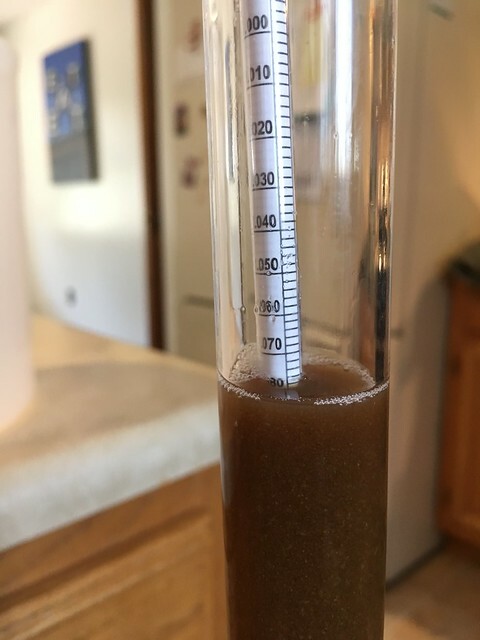 With five gallons ready, I took a hydrometer reading and… found that it was 1.071 — a solid five points over my target. I pulled up BeerSmith and used the calculators in there to figure out how much water to add to bring it down to 1.067 — which was only one point over and so close enough. Satisfied with my starting gravity, I got my flask of yeast, decanted off supernatant to get down to about 1400ml (i.e., right before it seemed to start to disturb the yeast cake too much), then I swirled it up, harvesting into a 400ml sample jar, and then pitching the rest. Into the fermentation chamber it went! with the temperature controller set to 72±1°F — though only with the heating element active (I wanted to let it free-rise). The 3726 yeast started off strongly enough. In fact, it was one of the fastest and most vigorous starts to a fermentation I’d ever seen. 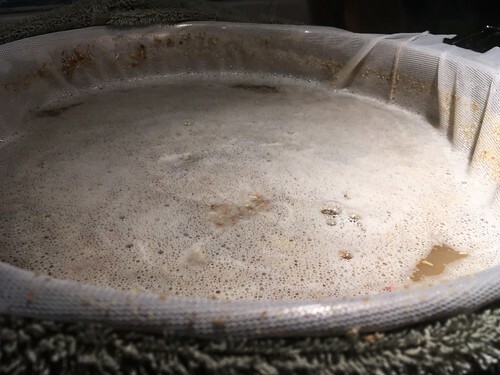 By the next morning, it was going completely bonkers — lots of krausen, lots of bubbling in the blow-off bucket — just an absolute beast. But this “bonkers” activity lasted only about 2-3 days before it settled way down. This was not completely unexpected, but it was a marked drop. After a week, I took my first gravity reading, only to find that it was sitting at 1.022. This wasn’t terrible (especially given the pound of chocolate malt) but BeerSmith had also calculated a final gravity of 1.017. Again: not terrible but given how much the activity had fallen off4 I thought it might benefit from some assistance. So I added 2½ teaspoons of yeast energizer and ramped the temperature up to 80°F. Which turned out to be pretty convenient. I bumped the temperature up to 84°F and walked away from it completely for 10 more days. When we got back5, I took another gravity reading, gritting my teeth the whole time. Turned out to be a pleasant surprise. Gravity had dropped to 1.018 by then — just one point above BeerSmith’s estimated target. But by the time I got around to kegging the beer (two more days) the gravity had — almost inexplicably — dropped another two points to finish at 1.016. Satisfied with that, I racked it to secondary, cold-crashed for 24 hours, then fined with gelatin. 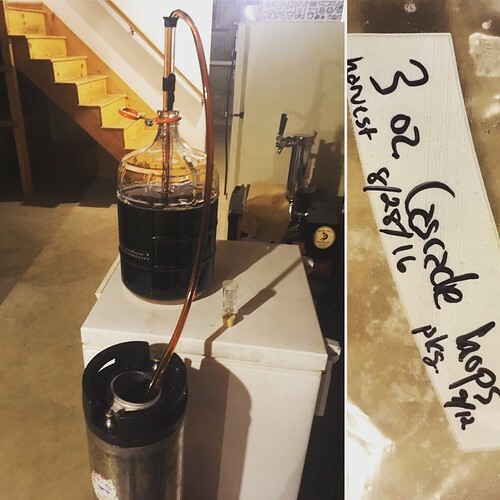 I packaged a few days later, siphoning into a keg and dropping in three ounces of whole cone Cascade for my first-ever keg hop. When I finally got Wookiee on gas and started pouring, I felt like it was a marked improvement over the original batch. 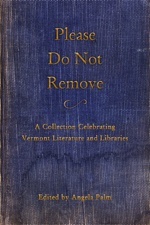 Essentially all of the astringency associated with the dark grains was gone. It had a smooth mouthfeel, even silkier than the first batch. Aromas were spicy and peppery, with a little grapefruit zest and mild floral notes. The flavor leads with spicy rye notes before leaning over to black pepper and (more) moderate grapefruit; there’s a very light hint of cocoa. Retronasally, the beer reads like a saison. But then there’s that finishing bitterness which is all IPA. Even with the first batch being a success, I’d been so afraid that with so much going on this would be a sodden turd of a disaster — clashing flavors all over the place. But I think it balances well, even if it’s a bit of a novelty. Second, this yeast… What can I say? Eventually it did the trick and got down where I needed it to go. But it took a long time. And a lot of heat. And coaxing. It produced some nice flavors in the final product — but three weeks, most of it at or above 80°F, seems absurd. Maybe I would have gotten better results had I fermented at lower temperatures? I don’t know. I’ve never seen (nor heard of) a strain that would be so vigorous for 2-3 days and then go into such a long tail like that. I’m open to the idea that this is just how this strain operates but it’s just so unlike anything else I’ve worked with. Lastly, I feel like I got the kegging and carbonation worked out correctly this time around. Oh, and this has been a great fireside beer. 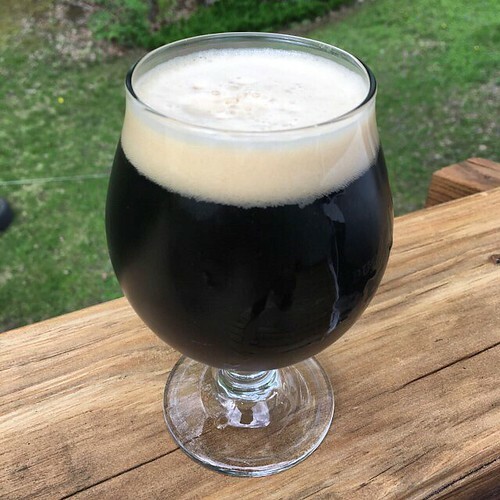 The partial mash (BIAB) recipe for Let the Wookiee Win (Mk. II) is as follows. Collect 14.25 qt. water and heat to 162°F. Mash in; hold at 152.1°F for 75 minutes. Add dark grains. Heat to 168°F over 15 minutes and hold for 10 minutes for mash-out. Bring to a boil. Boil for 75 minutes, following hop schedule described above. Add 3 lb. Golden Light DME with 15 minutes remaining. After knock-out, chill to 150°F as rapidly as possible. Add 2 oz. Cascade hops and steep/whirlpool for 10 minutes. Cool to 70°F as rapidly as possible and top off the fermentor to reach 5 gal. Aerate wort and pitch Wyeast 3726 Farmhouse Ale yeast. Ferment at 73°F for 2 days, but allow to free-rise as much as it wants. After 2 days, raise temperature to 80°F and add 2½ tsp. of yeast energizer. Allow fermentation to complete (approx. 2-3 weeks); if yeast seem slow to reach terminal gravity, consider raising the temperature to 84°F. After reaching terminal gravity, consider cold crashing for 1-2 days before packaging. Also consider fining with gelatin. 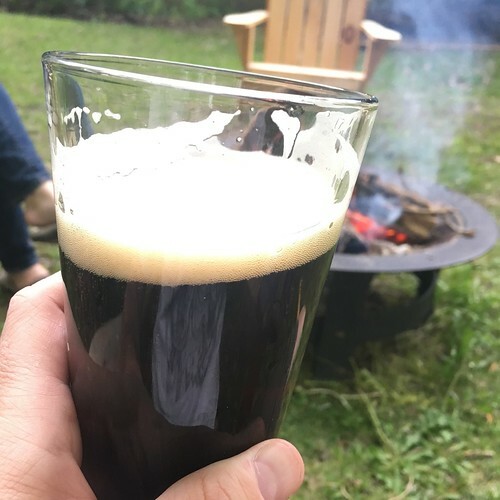 This entry was posted in Homebrewing and tagged black IPA, black rye IPA, homebrewing, Let the Wookiee Win, rye IPA, Tilde Gravitywerks. Bookmark the permalink.